The last IBM Global CEO Study (‘The Enterprise Of The Future’) interviewed 1,130 CEO’s in 45 countries and 32 industries, and found that organisations not only felt bombarded by change, but that many are struggling to keep up. Eight out of 10 CEOs saw significant change ahead, and yet the gap between the expected level of change and the ability to manage it had almost tripled since the previous study in 2006. That’s pretty serious. Late last year Forrester released a report on ‘Adaptive Brand Marketing’. Subtitled “Rethinking the approach to brands in the digital age”, the report set out how today’s brand marketing organisations are ill-equipped to handle the world of ‘always on’ marketing, and advocated an approach that embraced “rapid response to align customer and brand needs”, and saw channels as an outcome, not an organizing principle. We live in exponential times. A time of accelerating change. A time when transformational technologies are increasingly embedded in cultural norms. As John Naughton has said: “The internet’s disruptiveness is a consequence of its technical DNA. In programmers’ parlance, it’s a feature not a bug”. The relentless digitisation of products, services, and communications has created an environment of ubiquitous connection, and a shift from a linear industrial model characterised by command and control, where advantage comes from scale, scarcity, hierarchy to a networked post-industrial model distinguished by participation, collaboration and agility. But what does that actually mean? The software industry (the industry that gave us radical new working practices for collaborative business and innovation in the form of open-source) is once again showing the way. 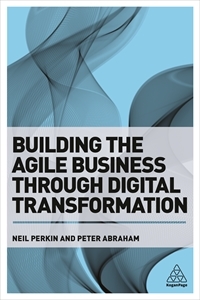 Agile Development offers up both new working practices that are inherently more adaptive, and a philosophy and mind-set that keeps businesses close to their markets and is altogether more fit for purpose in the always on world in which we now operate. Corporate ritual often places high value on organisational processes, habits, and technologies, and comparatively low value on things that individuals enjoy and derive value from – relationships, conversation, play, interaction. Seth Godin wrote about how organisations work relentlessly to de-personalise every communication medium they encounter: “the public works tirelessly to flee to actual interactions between real people, and our organisations work even more diligently (and with more leverage) to corporatize and anonymise the interactions.” The irony, he noted, was that an organisation with guts can go in the opposite direction and win. Agile working values interactions between individuals, active customer involvement, continuous feedback, transparency. Corporate ritual places high value in inputs – productivity, documentation, meetings. Agile working recognizes that it is more important to measure and focus on working outputs, so Agile requirements are barely sufficient, captured at a high level, not every detail specified upfront. This allows for swift adaptation and minimises the time spent on anything that doesn’t actually form part of the end product. A constant pace is maintained through a regular rhythm and pattern of sprints and iterative work cycles. Instead of waiting until an entire project is finished, priority is given to satisfying the customer through early and continuous delivery of value, meaning the output is highly relevant to the needs of the end user. The value that can be obtained through low-friction collaboration toward a common goal is often greater than that which can be obtained through tying relations up in over-detailed contractual relationships or organisational hierarchies. Silo culture does not respond well to iterative change, so a softening of traditional boundaries is required. Peter Drucker said: “In the knowledge economy all staff are volunteers, but our managers are trained to manage conscripts”. Dan Pink pointed out that ‘management’ is an invented technology from the 1850s, and that “management leads to compliance, but only self-direction leads to engagement”. Equality and empowerment of participants, or at the very least a more subtly dynamic rather than rigid hierarchy, is more motivating for employees, and for customers. Self-forming and self-organising groups that congregate around an objective or a purpose are naturally more efficient, effective, and motivated. The organisational role shifts from control, to one of facilitation. Business latency is decreasing dramatically – the ups and downs happen quicker, can be bigger – businesses need to react to changing customer opinion and needs, but agility is about responsiveness, not about velocity. The institutional urge is to plan ahead, wait for completeness, clarity, and stability before making decisions. To craft the perfect plan, and focus rewards and incentives around how well that plan is executed. Once the plan has been agreed by the business, it becomes a commandment, subject to change control and taking little heed of changing circumstances. Iteration becomes a cumbersome, laborious and often painful process with management time sucked into creating artificial or virtual value (justifying change, reporting), rather than generating real value (ideas, innovation, business outputs). If the plan doesn’t work, or is no longer what the market requires, you don’t find out until the plan is complete. By then, it’s too late to adapt and deliver a more fulfilling and successful end product. Agile says ‘just start and iterate along the way’, and welcomes changing requirements. Digital models are all about experimentation, rapid prototyping, optimisation, beta. The idea of lighting lots of fires, gaining feedback, and using it to adapt the allocation of resources, of chunking down big ideas and long timescales to smaller pieces which might adapt and change in response to a changing environment. Small, incremental fulfillment helps minimise risk, results in better control on costs, and allows for change. Beta is good but perpetual beta is better. The Agile Manifesto does not talk about the death of traditional models, but of a significant change in emphasis. Whilst there is value in the items on the right, the items on the left should be valued more. Similarly, agile enterprise and marketing offer up a way to close the gap that exists between digital ways of working and more traditional processes and practice. The time is right for change.